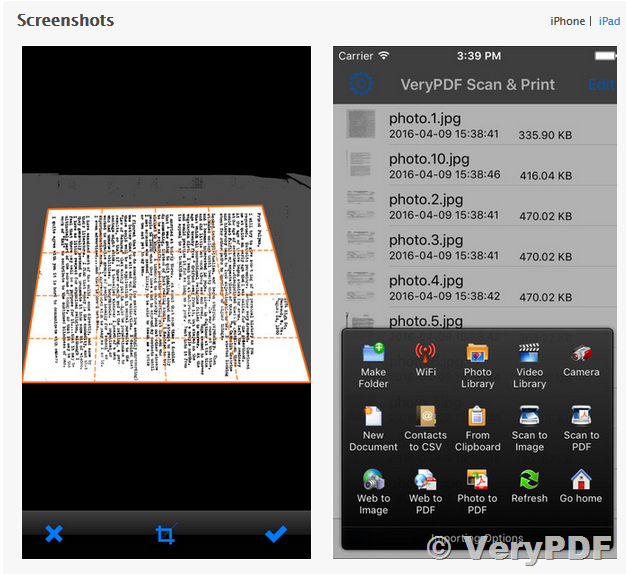 - SCAN with camera or choose photos from Camera Roll. You can scan as many pages as you want! - PRINT scanned documents, as well as the text from Clipboard, attached to emails documents and webpages. - EDIT scans perspective and borders, apply filters, adjust contrast, correct or change the orientation. 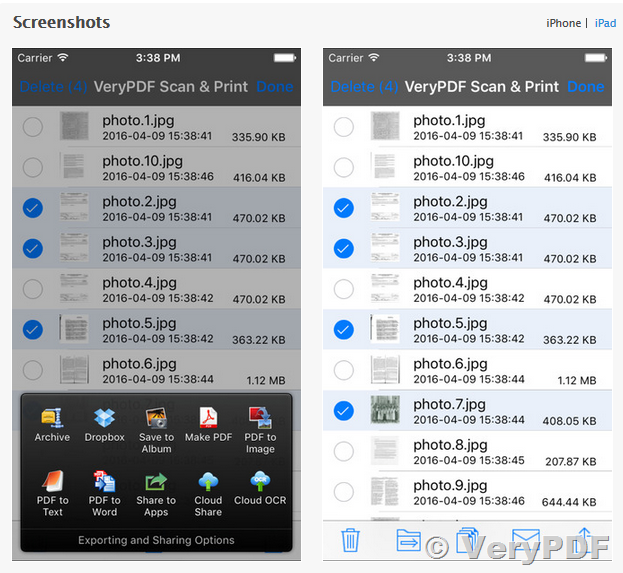 - STORE all your scans in iCloud and synchronize them between all your iOS devices. Stored documents can be protected with Touch ID. - SHARE scans instantly via Mail, iMessage, upload to Dropbox, Evernote, Google Drive, Box and more or simply save to Photos. - Quickly scan paper documents, whiteboards, business cards, books, posters, receipts, and everything to make them sharp and clear to read. - Auto detect document boundary to correct the perspective distortions efficiently. - Remove background shadows and sharpen text in the "Color" / "B & W" mode. - Adjust photo brightness and color saturation in the "Original" mode. - Detects the page frame, crops it and corrects the perspective: you don't need to take a perfect straight shot. 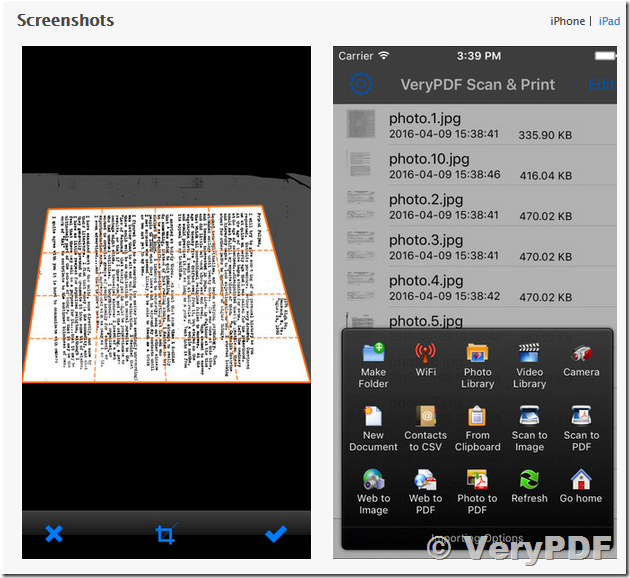 VeryPDF Scan & Print will remove any unnecessary background. - Tip: For best edge detection, please place your documents in high contrast to the background, i.e. put your white paper on a dark table. 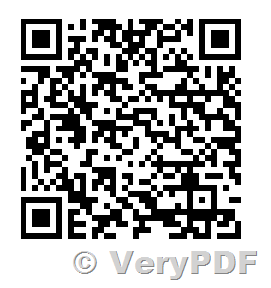 - All scans are saved as JPEG files and can be exported as PDF files from selected pages. - Print scans wirelessly in AirPrint supported printers. - Creates PDF documents with multiple pages. - Exports the documents to Dropbox and other applications. 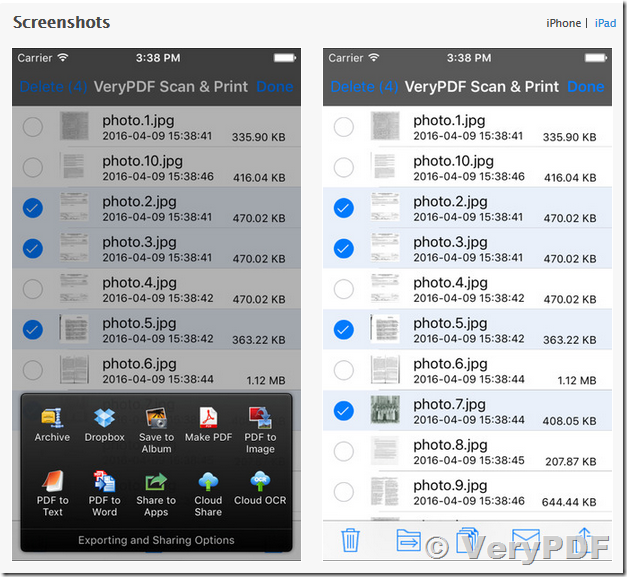 - Organize pages in different folders to classify your scans. - Show page thumbnails in grid layout, tap a thumbnail to zoom in, and swipe left / right to navigate pages. - Add text notes on any page easily. - Use your phone camera to scan receipts, notes, invoices, whiteboard discussions, business cards, certificates, etc. - Smart cropping and auto enhancing make the texts and graphics look clear and sharp. - Or any other multipage document for different purposes. Your feedbacks are very important to us. Our goal is to create the best tool to make it easy and fast for you to digitize your documents. We are always available to answer your questions and comments. 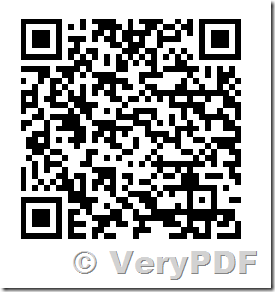 How to print many types of files into one PDF file? This entry was posted in iOS & iPhone & iPad and tagged copy machine, print file, scan paper. Bookmark the permalink.